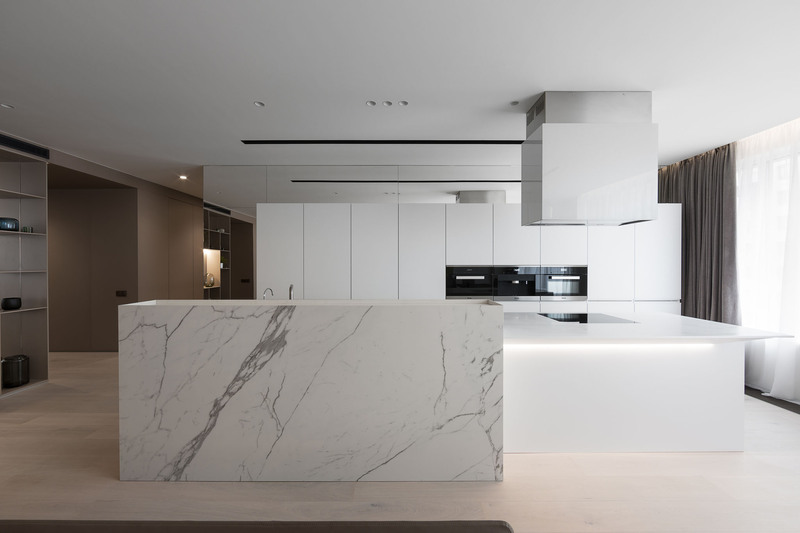 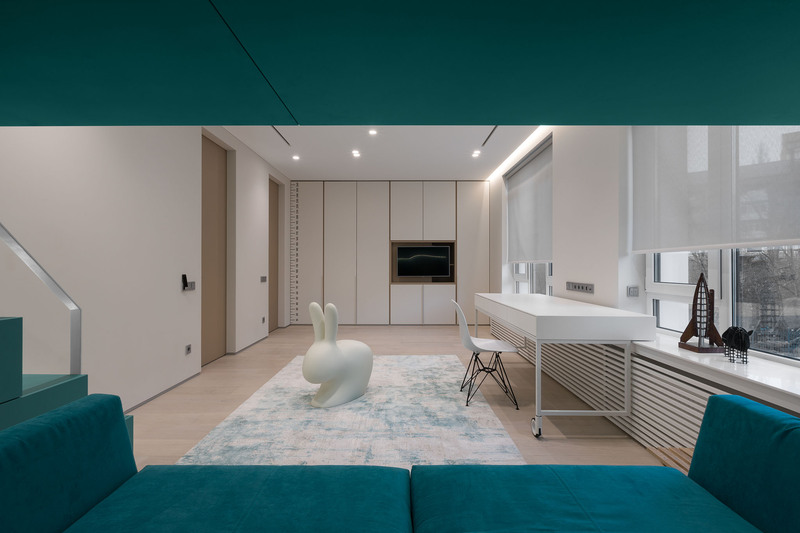 Everything in new apartment by MONO architects bureau speaks of simplicity and monochromatic colors. 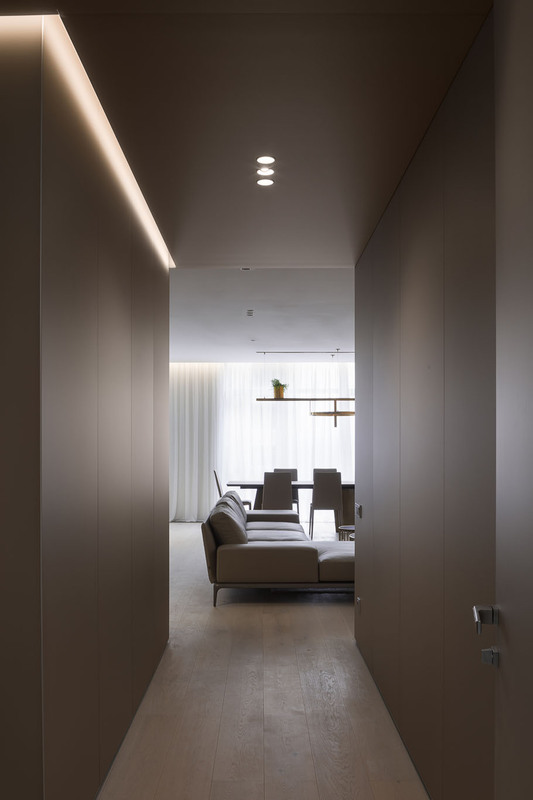 In order for the interior to look integral and deep, the authors used strict geometrical silhouettes, shades of grey, sand, and white. 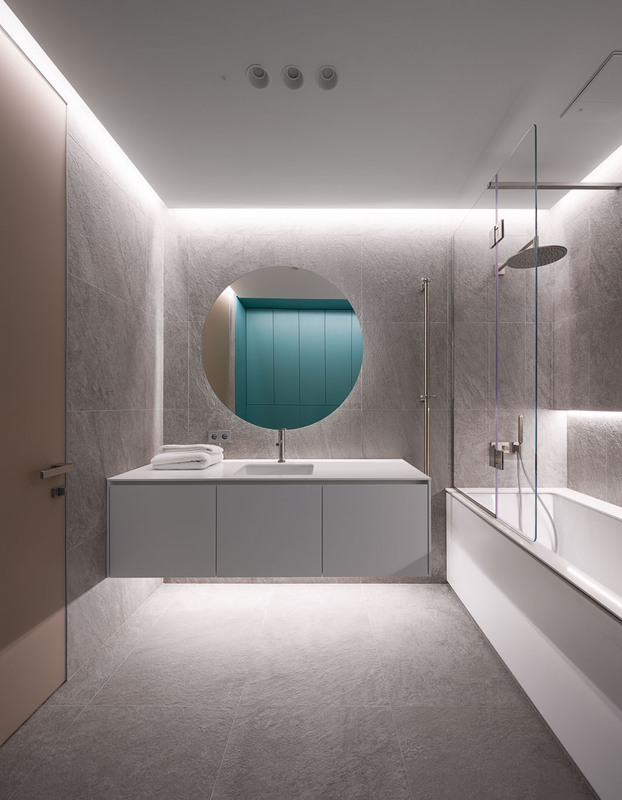 Reserved forms and colors are emphasized by elegant textures of light wood and marble, colored etched glass and textile. 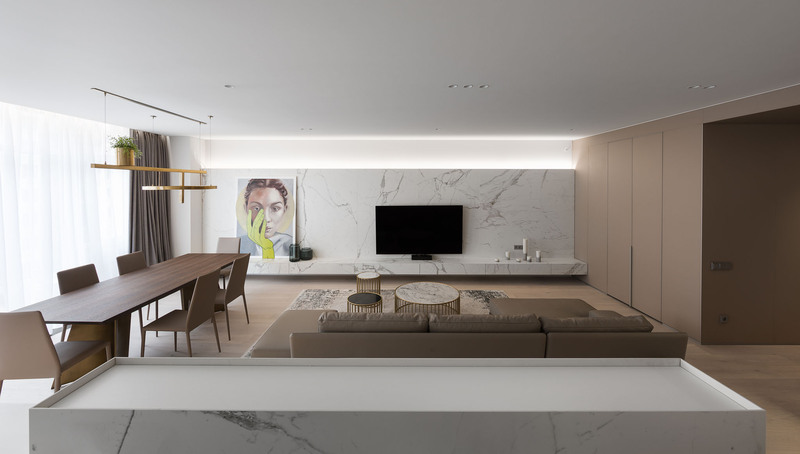 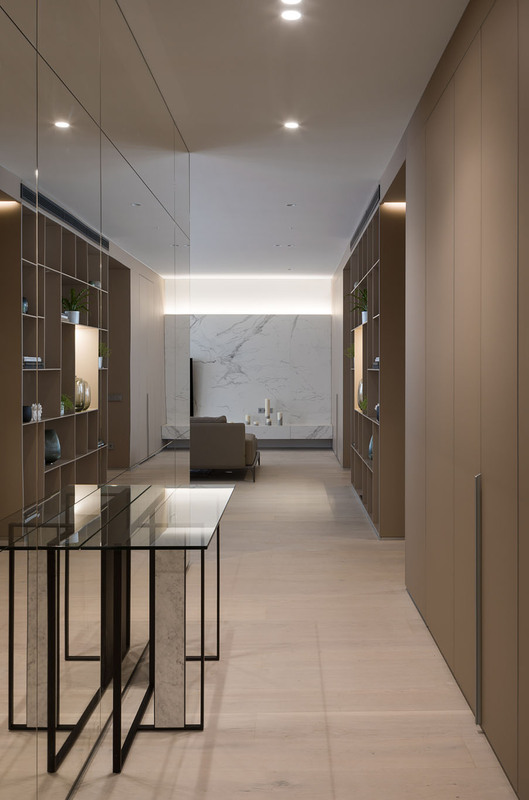 Thanks to fine work with volumes and materials, the space is simple, not overloaded by excessive details, and balanced. 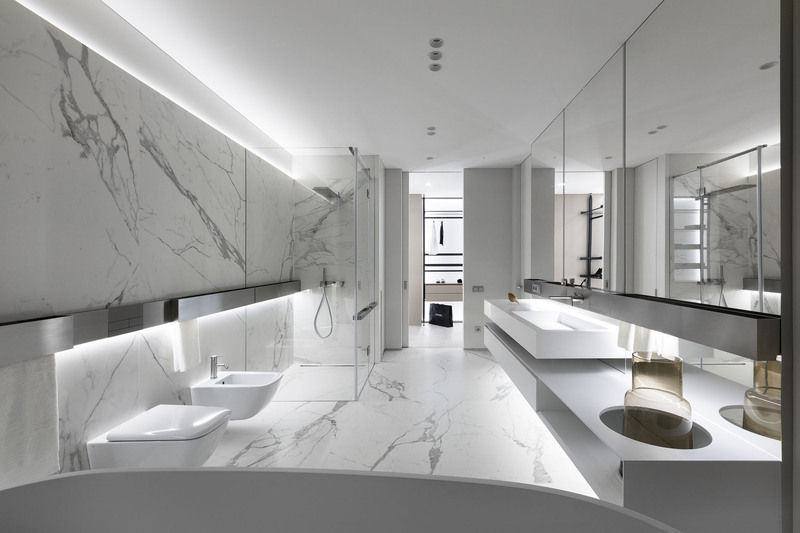 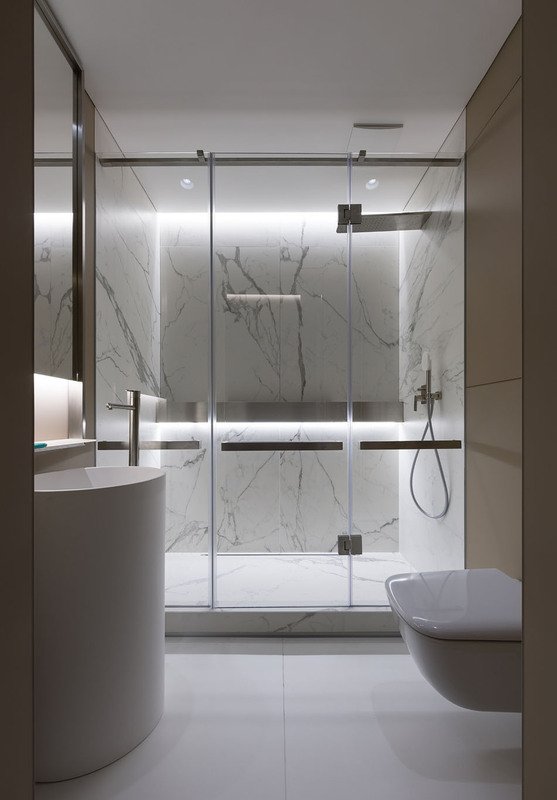 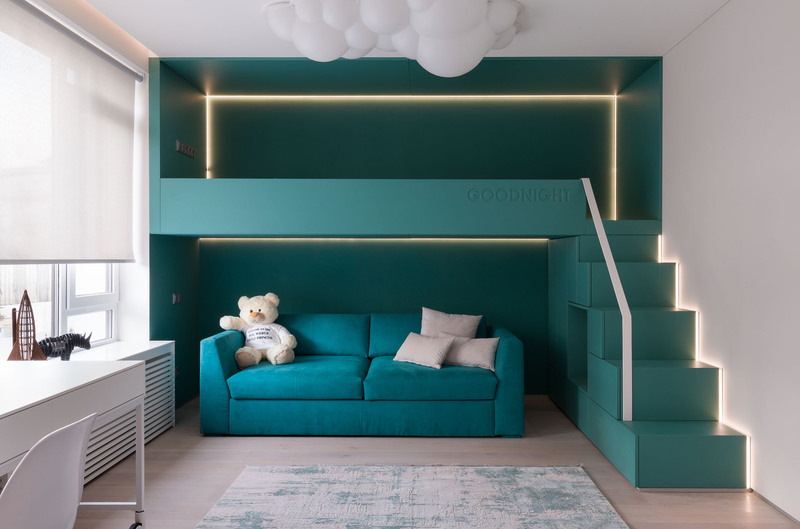 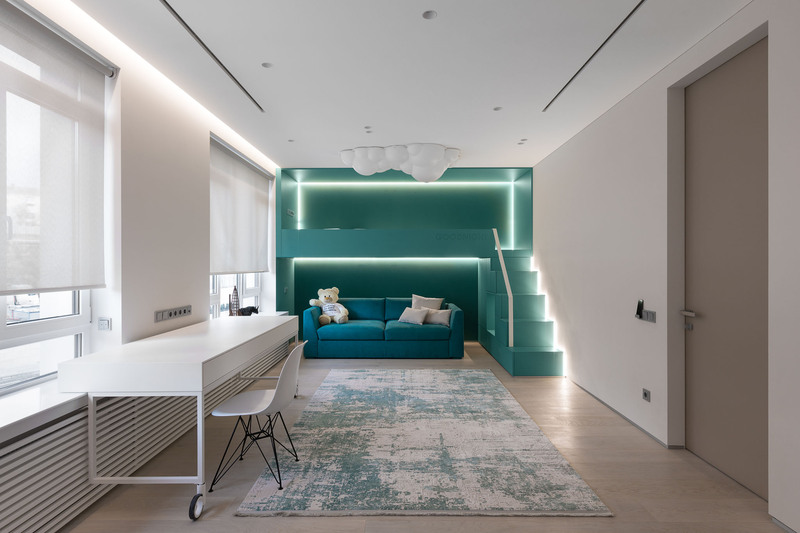 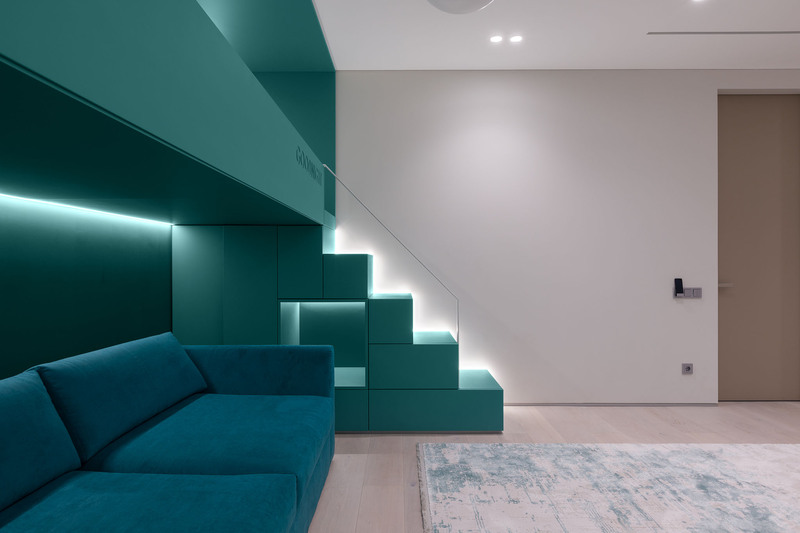 The entire area of a 175 square meters apartment is divided into the day and night zones. 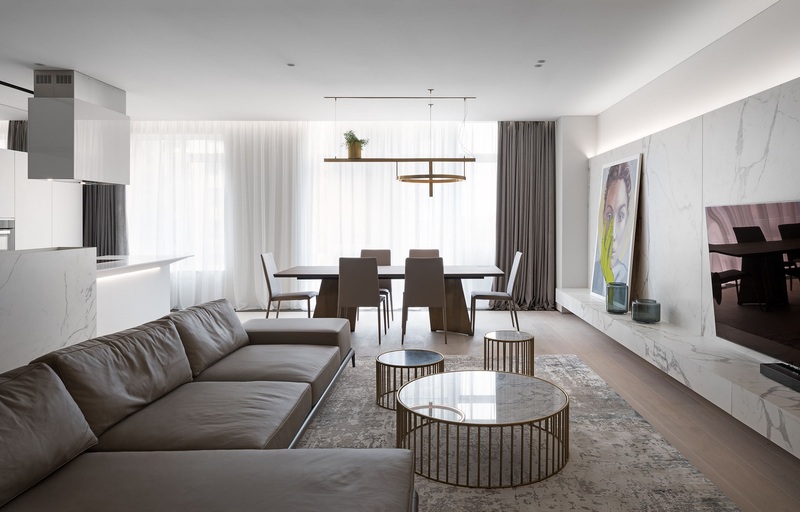 The day zone consists of a living room with a kitchen island, dining room, and a soft lounge. 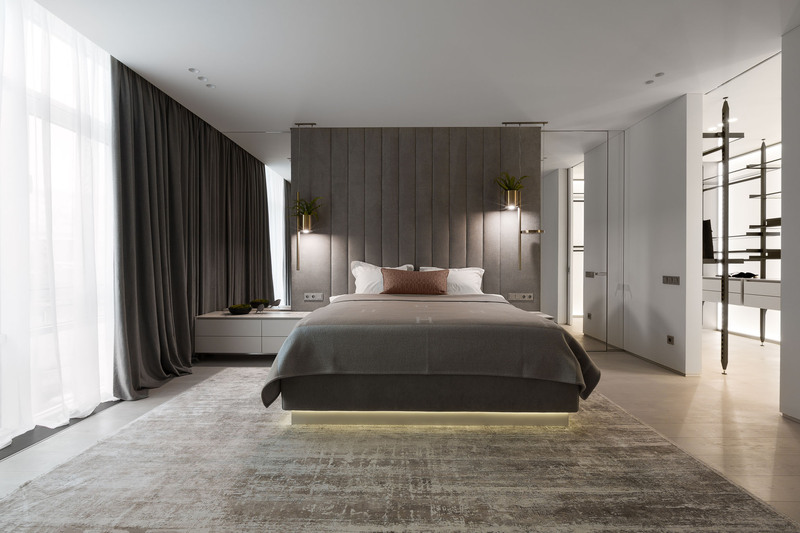 The night zone includes two bedrooms with individual bathrooms, a laundry room, and a dressing room. 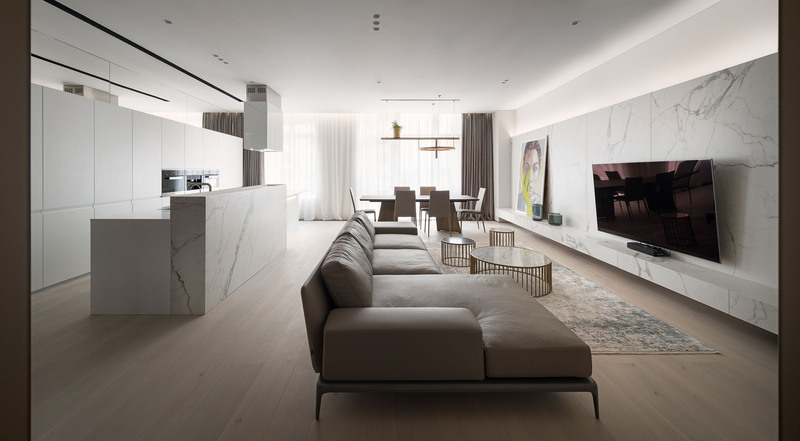 The elongated silhouette of the marble wall became the heart of the living room. 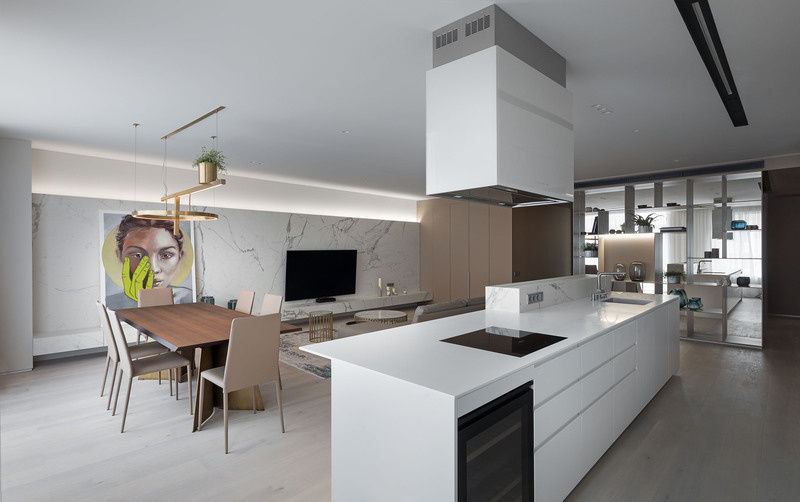 Kitchen island with lots of built-in storage spaces, Poliform leather sofa, Miniforms sculpted dining table, and a lamp by famous designer of things Dmitry Kozinenko complete the lounge area. 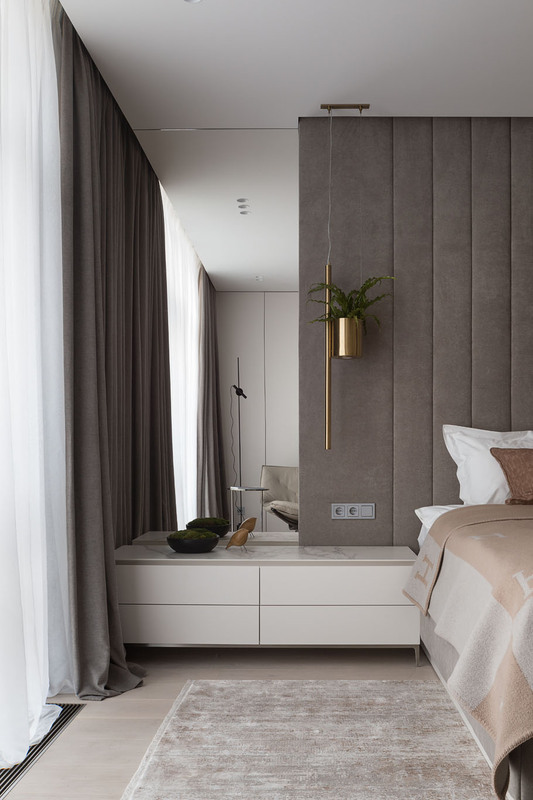 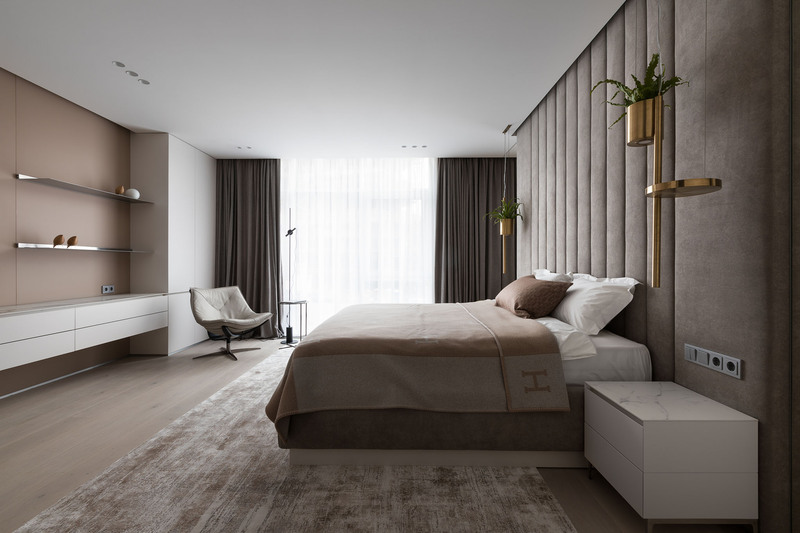 In the bedroom, reserved colors stand out when combined with soft texture of textile wall panels. 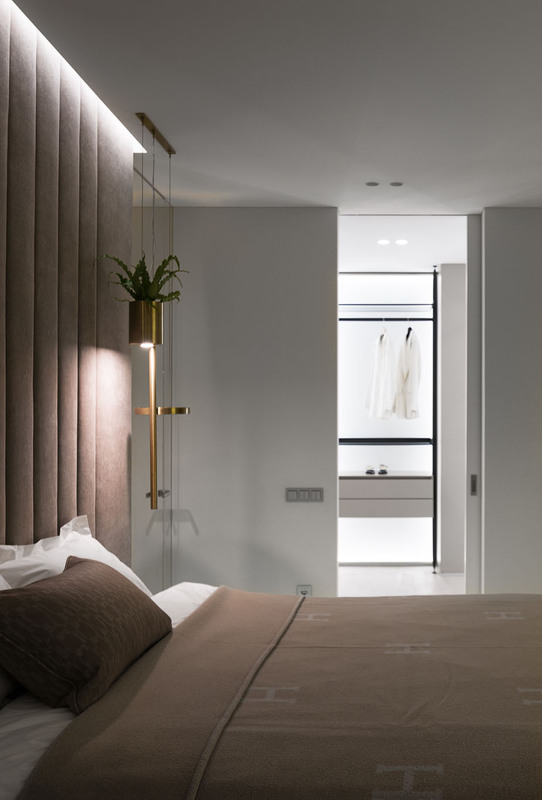 The space of the bedroom naturally continues into the dressing room area and a bathroom with a large panoramic window. 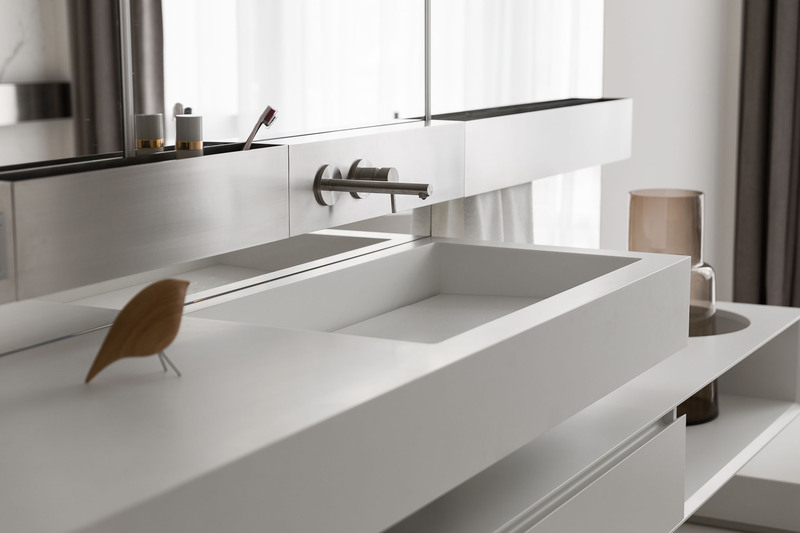 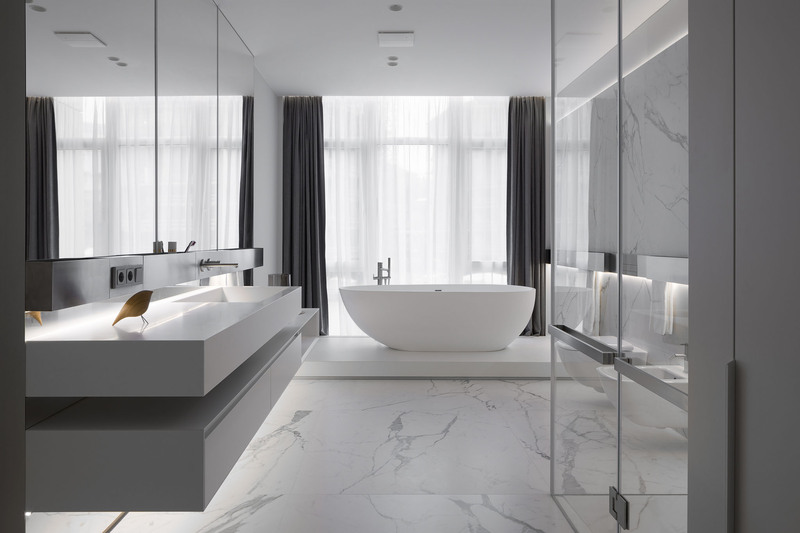 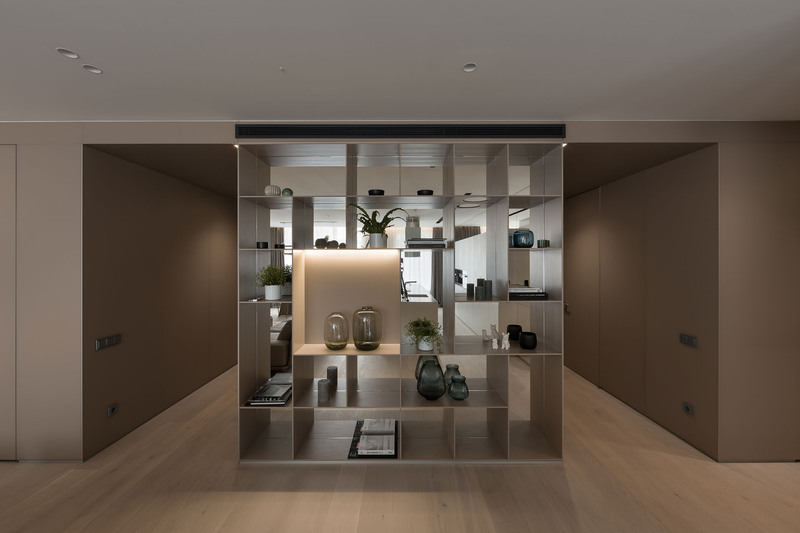 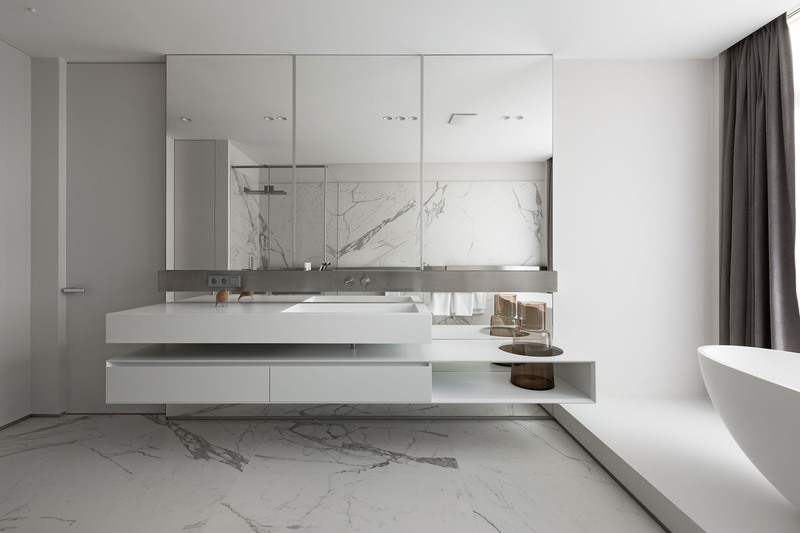 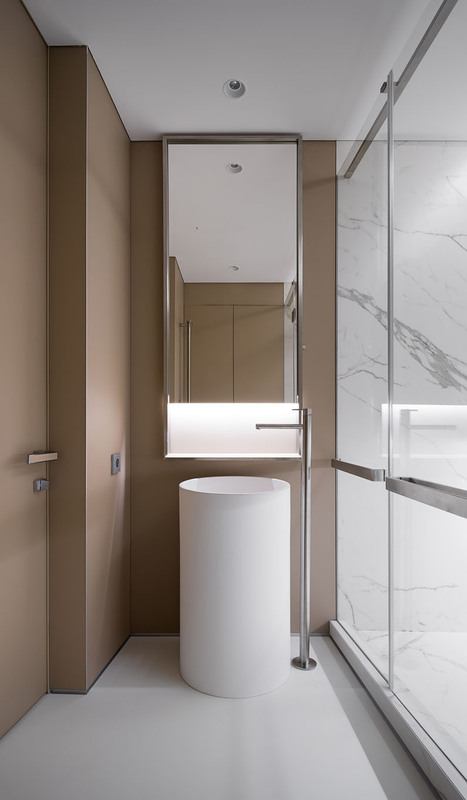 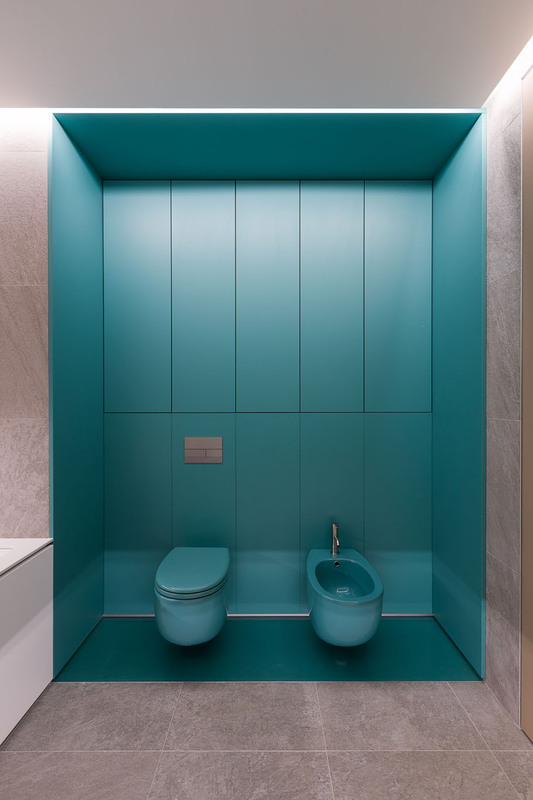 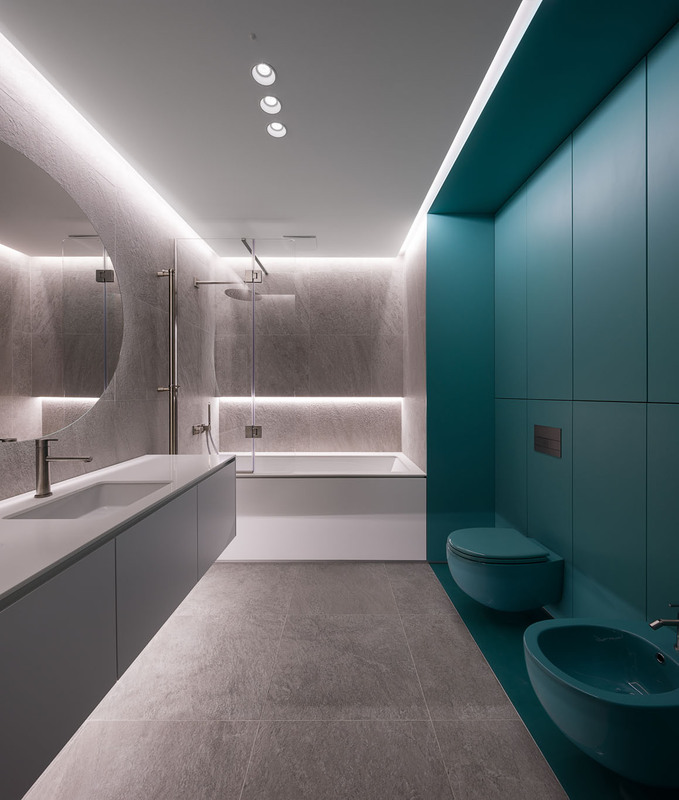 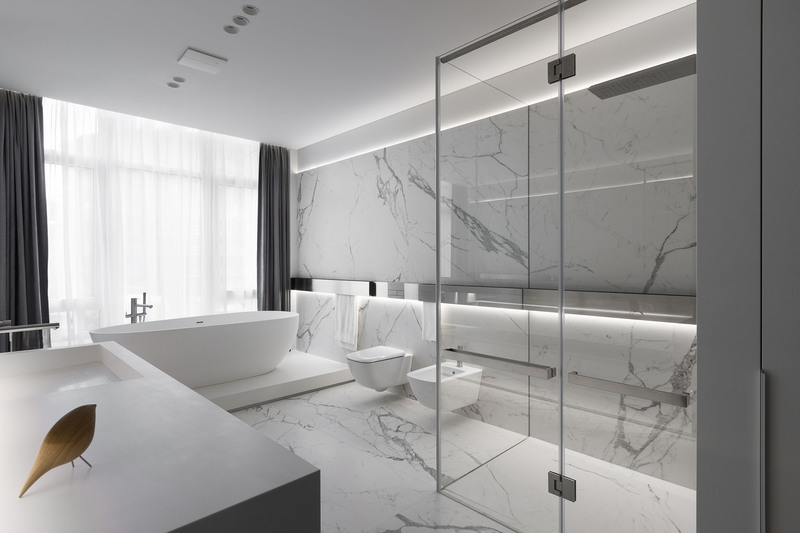 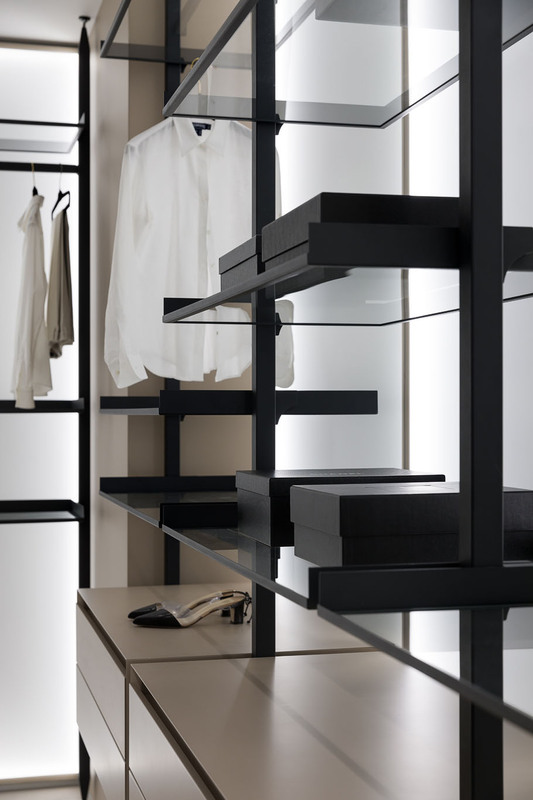 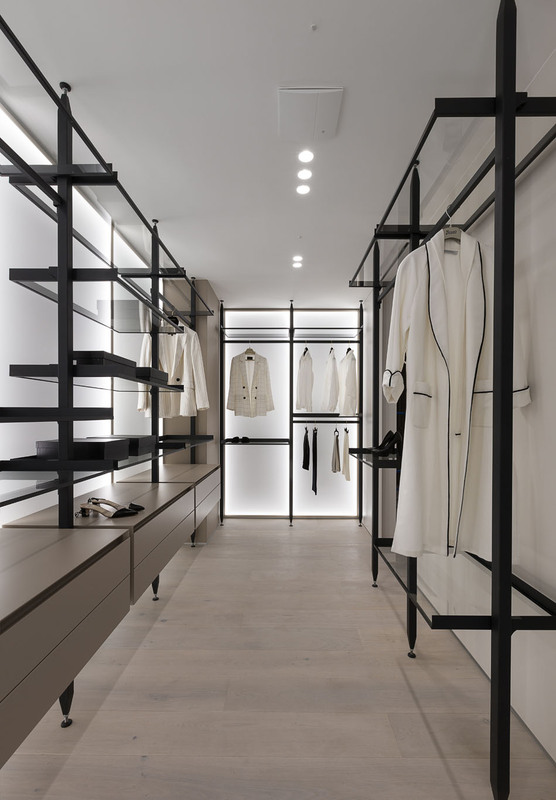 All cabinet furniture, dressing room, and stainless steel accessories in the bathroom have been designed by the studio and custom-made by Ukrainian manufacturers. 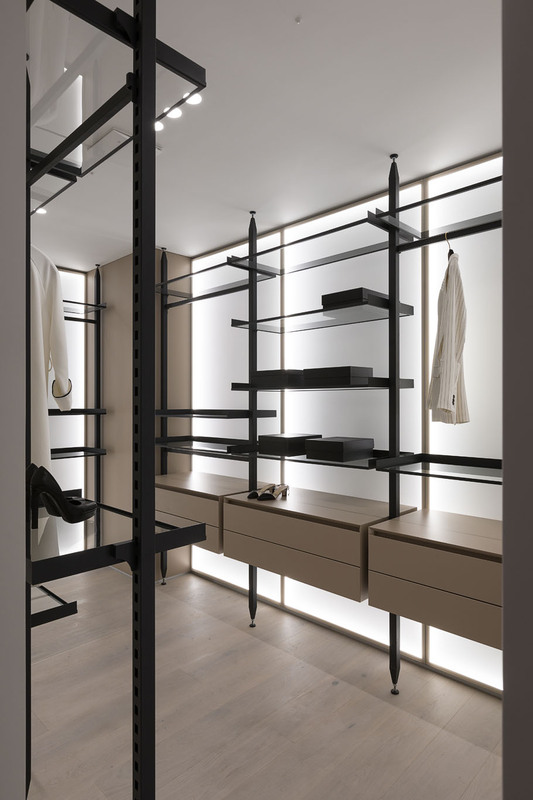 The authors paid special attention to the ergonomics of the kitchen and the dressing room, lighting in the rooms, and bathroom organization. 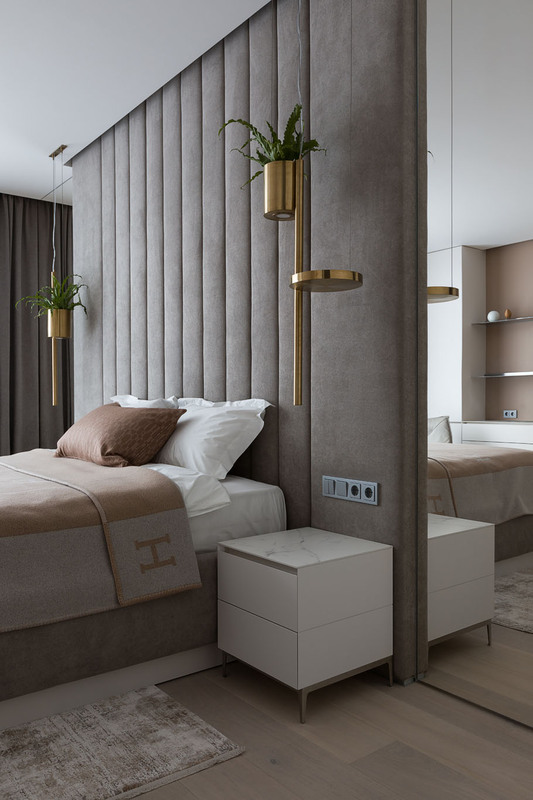 The apartment is equipped with a smart house system, which is easily controlled with the help of gadgets.